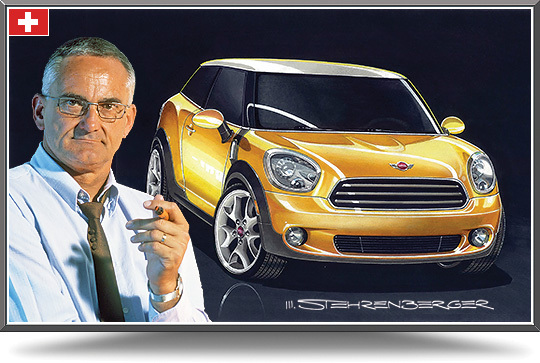 Mark Stehrenberger is internationally renowned for his dramatic illustrations in major car magazines. His signature logo has become familiar to millions of readers. By ‘revealing’ the look of future models from the world’s carmakers, he is considered the father of today’s spy shots. All of the renderings in this collection were published in magazines around the world to show enthusiasts what to expect in the not too-distant future. Since Switzerland lacked a car industry, Mark took a degree in fashion design from Cantonal Art School in 1963, then emigrated to California the following year. He designed lamps for a Los Angeles company, but always wanted a career in car design. He studied at Art Center in Pasadena from 1966 to ‘69 and developed his own distinctive drawing style and technique with markers, gouache, and pen and ink. He opened the Mark Stehrenberger Design studio in 1969, designing lamps, furniture, and home decor. In 1970, Bill Motta invited him to illustrate future cars for Road & Track. Other US car magazines followed suit, then European, Asian and South American publications. In 1971 Mark began consulting with manufacturers directly. The “Sports BUG” edition for VW was the first project, followed by Renault, BMW, Toyota, Ford, Rolls Royce, Nissan, Jeep, Saab, and others. From 1983 to ‘88, he ran a company with Alain Clenet in Santa Barbara, California, designing and producing full-size concept cars for international car makers. (Chip Foose was also a designer there.) Returning to his own design studio, he later opened a branch in Switzerland to better serve European clients, and has divided his time between both countries ever since. He has taught transportation design at Art Center College of Design in Pasadena, California as well as Art Center Europe in Vevey, Switzerland. Mark’s thorough experience in the auto design field has made him a much sought-after speaker / commentator / moderator at car events, as well as judging at Concours d’Elegance in the USA and Europe. He’s been featured in TV segments and numerous magazine articles in many countries. He has produced and moderated various radio and TV shows in the US and Europe on the subject of car design. Stehrenberger’s Cars for Dreaming collection is being exhibited in car museums and exclusive dealerships in Switzerland. His paintings and drawings hang in many private and corporate galleries. Commission Mark to create a unique painting or design for you! Call Peter Aylett at 949-443-0500 or email for details.